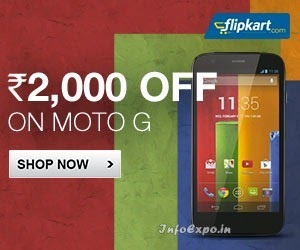 Mega Discount offer for Moto G on Flipkart. For the first time Flipkart is saling Moto G at a discounted price of Rs.10499 the 8 Gb variant and for Rs.11999 the 1 GB variant. Get your Moto G at the cheapest price. Flipkart is offering flat Rs.2000 on both 16 GB and 8 GB Moto G variants. The Moto G mega of Rs.2000 discount is a limited period offer. So hurry and make your Moto G purchase at this cheapest price before the offer ends.